DP World has announced it has formed a joint venture with a Russian fund to invest in Russian port and logistic infrastructure. The Dubai-based company, teaming up with the Russian Direct Investment Fund (RDIF), signed a document on the sidelines of the World Economic Forum in Davos, Switzerland. 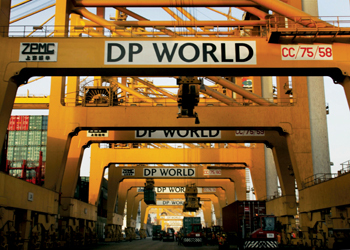 DP World will own an 80 per cent shareholding with RDIF holding the remainder. The JV, named DP World Russia, will target marine, dry ports and logistics infrastructure in different parts of Russia. DP World Russia is expected to potentially invest over time a total of $2 billion in upgrading Russian port facilities, while introducing international best practices in operations to improve trade connectivity for the benefit of Russian businesses, consumers and community. Sultan Ahmed Bin Sulayem, DP World chairman, said: “Russia has always been an attractive origin and destination market for us with huge long-term growth prospects. This joint venture allows DP World and RDIF to build on each other’s strengths in bringing economic prosperity to Russia. It is also another great example of the strategic partnerships with government stakeholders, a model that has proven very successful for us over the years. In other DP World-related news, the company announced it has been granted a 25-year concession to develop and operate a new logistics centre in Kigali, Rwanda. The DP World Kigali Logistics project is a greenfield concession agreement and the first phase will be built on 90,000 sq m with a 12,000 sq m container yard and a 19,600 sq m warehousing facility. Estimated annual capacity is 50,000 teu and 640,000 tonnes of warehousing space. Total project cost is estimated at $35 million, and further development will be phased in line with demand growth.